CROWN THE CROWN is a sword-and-sorcery novella structured around the Tarot Cards. In an ancient realm the City of Tarro is blessed by the benevolent magics of the Sorceress Luminata and her beautiful daughter Wand, who live in the shining tower. The city is celebrating Wand's coming of age, the streets are full of happy dancers. A band of Gypsy entertainers arrive with cheeky fanfare. The evil Sorcerer Otius also arrives, although silently and in secret until he strikes with destructive magic. No one can stop him: Wand is abducted to far-off Castle Darkstone. 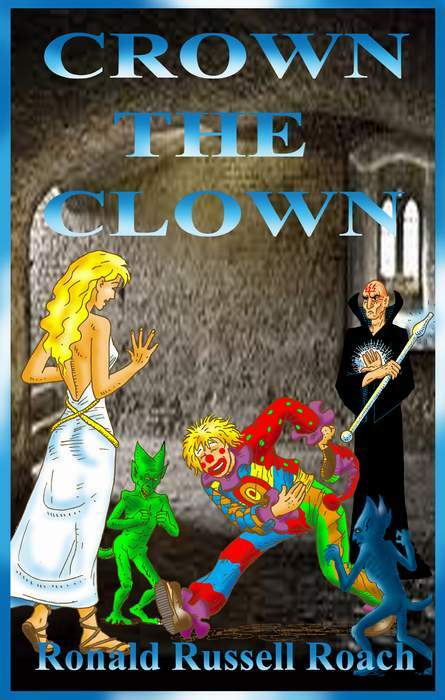 The gypsy leader, Benutio, offers a hero for the quest to rescue Wand--their Clown, an amazingly agile but incredibly stupid fool, who is infatuated with the Sorceress's Daughter. Although desperate, Luminata rejects the idea as absurd. However, Benutio explains that this particular Clown is a simpleton because long ago an evil curse had been cast upon his forefathers by that very same sorcerer Otius, resulting in seven generations of idiots. Benutio's suggestion to Luminata: lift that curse, unleash those lost 7 generations of intelligence within the Clown, then let's see what he can do.